Until only a few weeks ago, Imperial Beach looked like the next city in our region to establish a system of marijuana permits. But a group of anti-pot activists from around the region — warning of potential poisonings and children’s well-being — caused some officials to second-guess themselves. Anti-marijuana activists want to re-litigate Proposition 64, the state ballot measure legalizing marijuana, inside city halls across the San Diego region. And in one of the least likely places, it’s working. 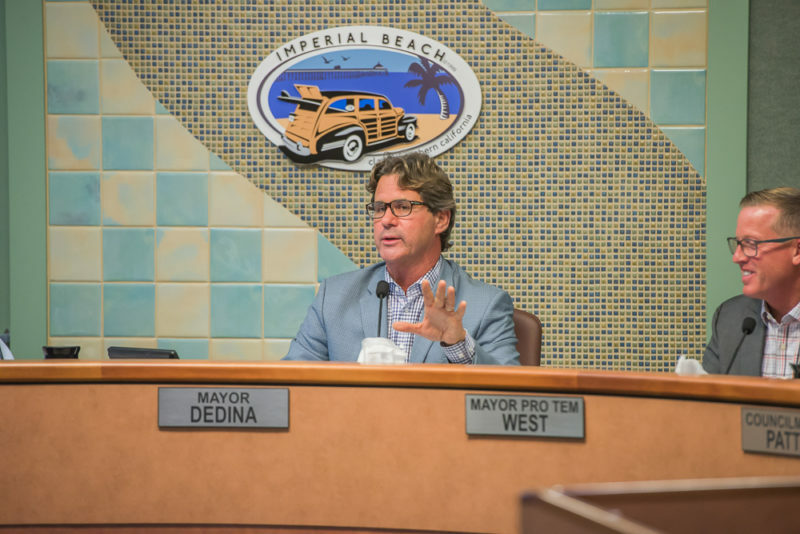 Imperial Beach has been crafting marijuana regulations for a year and a half, aided by overwhelming support from the community. But what looked like a done deal was upended last week when a group of drug and alcohol abuse prevention activists and youth advocates dominated the spotlight, complaining about the corruption of children and alleging that dispensaries are pushing poison. In the process, they challenged some of the pot industry’s best arguments — that marijuana has medicinal properties and can be sold safely — and cast enough doubt on the debate that members of the City Council began to second-guess their earlier support. 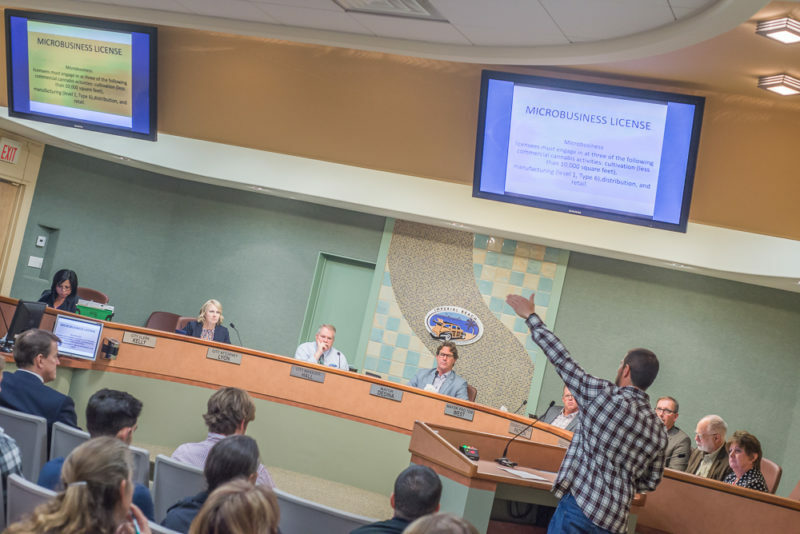 An ordinance allowing for one dispensary — with the possibility of a second down the road — barely survived the City Council meeting on June 6, passing by a 3-2 vote. A second and final reading of the ordinance was supposed to occur on June 20, but officials agreed to wait until July 18, giving the public more time to weigh in. Whether regulated pot comes to Imperial Beach is going to depend on residents turning out at the City Council’s hearing next month. The tie-breaking vote is likely to fall on Councilman Edward Spriggs, who said he needs to see objective data on the topic. He wants a cost-benefit analysis of regulating a dispensary and a clearer understanding of how the state is ensuring marijuana products are safe. “I would like it to have a better public record,” he said, “and better evidence of community input than just the two sides” — meaning, the people who want to get into the industry and those who’d like to uproot it. Most of the opponents of Imperial Beach’s ordinance do not live in the city. They are traveling the region, asking governments not to listen to the marijuana industry or acquiesce to the political and public pressure. More than 62 percent of Imperial Beach voters favored the legalization of marijuana in November 2016. More than 90 percent of residents who were surveyed at a workshop in December 2017 said they’d prefer to see regulations crafted by elected officials than by an outside group at the ballot box. Some of the same activists who turned up in Imperial Beach turned up earlier this year in Chula Vista, where support for Prop 64 was closer to 50 percent. But in Chula Vista, the voices of opponents were drowned out by industry professionals and local businessowners who are eager for a piece of the new marketplace. In both cities, the threat of a ballot measure by industry professionals had created a sense of urgency, pushing officials to create rules for marijuana businesses they didn’t necessarily want. Some of the claims made last week by opponents in Imperial Beach were misleading — and highly effective. Multiple opponents mentioned a 2017 UC Davis study in which researchers analyzed 20 samples of medical marijuana flower from Northern California dispensaries and found a variety of bacteria and fungi. “As a city that cares about environmental issues, please consider these things and consider the message we are sending our children,” said Carol Green, a Chula Vista resident who works with the California PTA. But what Green and others did not say was that the UC Davis researchers cautioned patients with weakened immune systems — especially those suffering from leukemia, lymphoma or AIDS — against smoking, vaping or inhaling aerosolized marijuana products. Edibles, the researchers advised, may be a better option because baking at high temperatures could destroy the microorganisms. Messages left with four of the activists were not returned this week. The state’s testing and labeling rules go into effect July 1, with a second, tougher phase of the process beginning in 2019. Starting in three weeks, dispensaries will no longer be able to sell products that haven’t been tested for pesticides and residual solvents. Several of the opponents in Imperial Beach also alluded to increased crime and violence in Colorado, citing a 2015 report by the Rocky Mountain High Intensity Drug Trafficking Area, a federally funded law enforcement group that’s opposed to legalization by design. Its conclusions about marijuana-related traffic accidents and teen usage have been picked apart by journalists — as well as the governor and attorney general of Colorado. But after listening to the opponents last week, Bragg changed her mind. She questioned the need for an ordinance now that a November ballot measure was unlikely. The Association of Cannabis Professionals had gathered hundreds of signatures for a petition allowing, in addition to dispensaries, a marijuana consumption lounge and manufacturing facilities, but the city clerk rejected the paperwork because of an error. The group sued and lost and is appealing the court decision. Councilman Robert Patton, too, urged his colleagues to slow down on June 6. He said he’d recently consulted a group of 13-to-15-year-old students at a picnic and the teens thought legal marijuana was a bad idea. “As a teacher and parent, that really sunk in,” he told Voice. Imperial Beach’s moratorium on marijuana outlets ends in February 2019, and it’s unclear what will and won’t be allowed then if there are no regulations on the books. Industry professionals could always introduce a new ballot measure. Dedina said he hopes the next hearing provides a more balanced array of opinions rather than just the “doom and gloom folks.” He said he’s fine having a conversation about the importance of crime reduction in Imperial Beach but would want it to include alcohol and other substances. The city is home to dozens of liquor stores. “I’m hoping we can move forward with this in a sensible way,” he said, citing two other topics that are deserving right now of the council’s attention: housing and pollution.